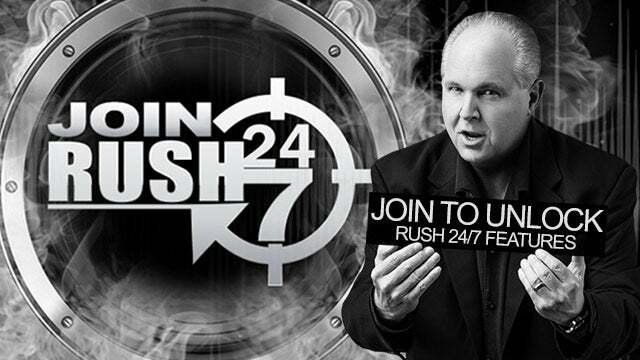 RUSH: I first want to start out by saying we have hit another record of subscribers. We’re at peak subscribers at RushLimbaugh.com. This is really gratifying to me. We’ve been doing this a long time. Twenty-five, 30 years we have been doing this. You would think that peak would happen at some point in the past and there would be either a leveling off or maybe a slight downturn. It’s just the exact opposite. Since the election of Donald Trump, the audience is growing rapidly. The subscribers that we have at RushLimbaugh.com and the numbers of people who are downloading and using the RushLimbaugh.com app for the iPhone, the iPad, and your Android devices is just blowing things away. I mean, it’s all-inclusive. You can watch the Dittocam. You can listen live streaming. You can go podcast however you want. You have access to transcripts; you can share them. So if you hear brilliance on the program and you don’t think you’ll remember it all yourself to tell somebody, just share the transcript right from the app, right from the website. But the point is that we’re at an all-time high after all these years. And so thank you.